Coming events | Fattorie "Il Filo d'Erba"
Menu designed with spontaneous flowers. From appetizer to dessert, flowers will be the stars of the evening, a dinner full of flavours, colours and delightful scents. At 18.30, and lead by the cook, we will start the gathering, tasting and cooking of spontaneous herbs among the farm. Dinner and tasting of spring organic leafy vegetables and herbs soup. Tasting of our farms flavoured Schnapps (Grappa). 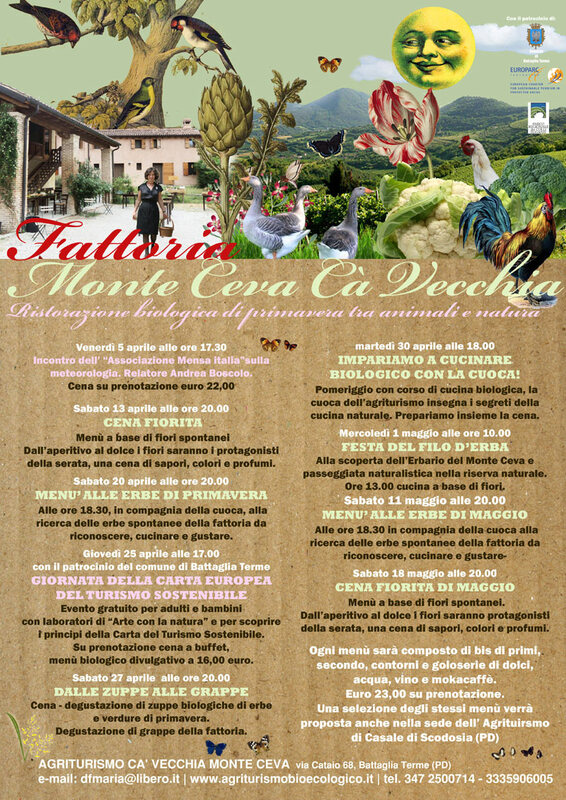 Let’s discover the beauties of Monte Ceva Herbarium and take a stroll in the Natural Reserve. Blooming lunch with flower based menu. Learn about: "The Pork's Metamorphosis" in the Venetian Traditions. Venetian Liver, "Martondela" with Rosemary Potatoes Croquette. "Manai", Tastatale (Fresh Salami Paste) Risotto. Mini Ribs with Smothered Cabbage ("Verze sofegà"). Kiwi Sorbet, House Biscotti, Home Made Jam Tart. The Anniversary of Valentine's Day. Valentine's Day is a holy day of the martyr who was once beheaded for pursuing a new way of thinking about life and how to say "lose your head", which today means to fall in love! This day teaches us about self-renewal. Valentine's Day is a celebration which is related to seasonal change. This coincides with the adage, "back to the nest go the birds" which refers to the continuation of the species and the arrival of spring, a time when nature is reborn. On this day in ancient Rome the Goddess Februa, who is a goddess of fertility, is celebrated. This is because the celebrations begin in mid-February, a time of the year which traditionally announces the beginning of the spring period. This is also an important time of "felt", a word which is used in reference to both mating and planting. We look forward to celebrating this night of love with you, and our restaurant is preparing specialties with an extra pinch of love! Oven cooked Pork served with lamb and thyme meatballs as well as an array of seasonal side dishes. A chili, nuts, and cardamom Chocolate Cake (made without flour). Artisan Water, Wine, or Mokacaffè. A festival which is linked to rural life... where anything goes!! And for the children, there is the Feast of "Lumaza" which features a candle-lit pumpkin!! Lumaza is a party lasting from the 30th of October until the 11th of November: 12 days linked by a single tradition. There is a difference of 11-12 days between the solar year and the lunar year. This is called ‘Dodekameron’ (12 days) which is termed of "time out of time." This virtual time that "agrees" with the solar year, as well as the lunar calendar, is placed in our tradition at the end of the agricultural period. In this "time of no time", the living and the dead are in a position of harmony together. This period, according to the natural order of things, marks the passage of light which now fades to darkness. During this period, we are approaching the shorter days of the year, and cereal seeds are planted in great numbers. From now until spring, for the success of the harvest, the farmer can only try to appease those who share the ground with these seed: the saints, the gods of the underworld, the dead, as well as all good and mischievous spirits. So, the 1st of November until the 11th are dedicated to the celebration of All Saints. November 11, in particular, honours San Martino; patron saint of farmers. November 2 is a day we pray for the dead, according to their earthly influence. Then on October 31 costume dresses are worn, use of masks and the preparing sweets evokes the spirits who then assist in the survival of that which is underground. Many assorted gifts are also prepared in the hopes that even the most restless and mischievous spirits will look kindly on the reception of these gifts and reciprocate with good will that ensures good care be given to the seeds and crops. A well cared for crop equates to our survival also. The mask was originally linked to the tradition of the dead. The first forms of ‘masks’ in history are those worn by the Egyptian mummies. The cover made for mummies were the" masks "of the dead!! The festival which honors the dead, is not only a commemoration to them, but the celebration of the life cycle; death through to rebirth. During winter a seed is buried dormant within the earth. The seed awakenings and emerges from the ground in spring. This is a magical time when you can do anything, hence the thinking that it was ‘time out of time’, and that anything was possible! On this day, our usual clothes can be abandoned and we can dress-up with clothes that simulate other roles, real or fantastic... goblins, witches, and monsters to come life when we dress in "masks"! The disguises come in dominant colors of the approaching black darkness of winter, the orange of leaves and pumpkins for carving, or monstrous masks in the purple of the underworld. The offerings for the dead are sweets which often mimic the same forms as the bones of the dead, but also there are seeds of fruit such as figs and pomegranates. Children participate in dressing up, exchanging gifts with the deceased. The children receive gifts "of merit or demerit" from the dead, but also they journey from house to house so that they may ask for gifts from the deceased. The children use the now traditional phrase of "trick or treat''! We examine the various types of earth. We prepare the land: the land is plowed to form the "bed of earth" in which the seeds rest. We entrust the seeds to the earth. It is also now time to get the kiwi! We build our masks and play Trick or Treat. We are pleased to invite you to the feast of San Martino! We tell the story of San Martino as taken from the testimony of Sulpicius Severus, a writer of the time. 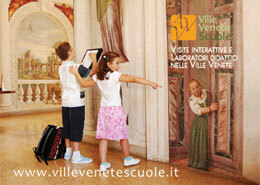 San Martino's Day, in the country tradition, ends and begins the new agricultural year. It is the day when the herdsman was confirmed by the master of his trade or was forced to move on to a new location. San Martino’s day is in remembrance of this tradition while at the same time making clear to children and adults that they must remember what life was like in earlier days, when one was made to hide under the porches, in the old barns within the courtyard, and also what was needed for the move, and accepting the need to leave behind what was not essential as well. We invite the children to search for objects and animals with which to load the cart prior to the move. The name and use of every object is discussed before the object is put into the wagon. It is a little treasure hunt! Here comes the master! The old herdsman and his wife give a description of vintage agraria and details what is to be expected of those who will be awarded confirmation. If the owner is happy with the work, the herdsman is given back the "caveza" and for another year, their work, bread and shelter are insured. In the woods that front the barn there is a strange movement. The animals are a bit 'restless ... In the fog appears and disappears a figure on horseback wearing a typical cloak. Near the well, covered with a sack, a child (volunteer) complains about the cold and acts as a "peasant" ... Meanwhile, the fog clears and it is now the Indian summer. The rider is closer and closer. Upon seeing the peasant, the rider dismounts and takes off his outer cloak. The rider covers the peasant with the cloak, protecting them from the cold. The rider is San Martino, and he has a big bag full of treats (made in the form of Knights). Half of the children are presented treats. These children are the "rich" ones, and they are given the recommendation that they share with the other children, the "peasant" children. Chestnut treats are cooked and kept warm under a blanket; someone is preparing to serve them in small paper cones. In the nearby caneva, wine awaits. The geese had an important role in the life of St. Martin and his board game’s theme. This game is related to the bigger game of ‘the goose farm’. Boxes and discs are painted to represent rural stakeholders whom have children in the court. There is a mingling of all participants which makes a very festive atmosphere. Packed Lunch or "Frugal" Dinner which is prepared by the Farm. We enjoy a walk outdoors. Then, we launch balls of clay. The children are accompanied among the various types of terrain. We then make a game of sewing. Using clay balls, we later will throw the balls to disperse seeds. Even children can help create a little paradise playing with the balls of clay which are inserted with the seeds of vegetable, fruit trees, forest trees, green manure crops, and plants that enrich the soil as well as create fertility. Some of these seeds are collected by the children who are participating in the activity, but anyone who eats peaches, cherries, apricots, or any kind of fruit, can leave the seeds dry and offer them to people who would later sew them. The balls are prepared and sown manually before the start of the rainy season, as well as in the fall (September-October) and spring (March-April). Our commitment is to spread the clay balls. Nature will take care of the rest. With the coming rains, some seeds sprout - some do not, some plants survive and others die, but slowly the location’s vegetation will change. The balls are made of the same clay used in the forming of tiles or bricks. Other materials can also be added such as cotton or sawdust, to create balls which are more resistant to the elements. There is nothing scientific about this process. There is no wise method of choosing of which seeds to use, we simply collect all the seed varieties found in nature, from which we prepare and sew the balls for throwing.